World leaders in impact investment converged on New Delhi, India, last week to determine their part in raising $2.5 trillion every year to achieve the Sustainable Development Goals. The Global Steering Group for Impact Investment (GSG) hosted its 4th annual Impact Summit, bringing together more than 700 hundred ‘impact leaders’ from more than 50 countries. Making star appearances this year were Nobel Laureate and former US Vice-President Al Gore (pictured top), and Tata Trusts chair Shri Ratan Tata – along with video messages from the likes of musician Bono and graffiti artist JR.
Gore, now a leading environmentalist and also co-founder of sustainable investor Generation Investment Management, made the case for impact investments to achieve climate and social justice. “The vast flows of capital needed mean that impact finance is a crucial part of the solution,” he told the audience on Tuesday night. The GSG is an independent global steering group “catalyzing impact investment and entrepreneurship to benefit people and planet”. It was established in August 2015 as the successor to the Social Impact Investment Taskforce established under the UK's presidency of the G8. The GSG currently has 21 countries plus the EU as members – who convene as ‘National Advisory Boards’, each gathering together key influencers, investors, philanthropists, business leaders and social entrepreneurs in their respective countries. Much of the discussion at this year’s Summit focused around addressing the estimated $2.5 trillion annual funding gap to achieve the SDGs by 2030. A significant part of this would be achieved through the growth of impact investment itself, delegates heard. But even more significant would be the progress that would result from setting business, governments, consumers and world leaders on a pathway towards “impact economies” – a way to grow global prosperity for people and planet that was not built upon profit alone. Playing its own part in the impact revolution, GSG said it aimed to help grow the impact investing market from $150bn to $300bn – benefitting 1 billion people – by 2020. It also announced the launch of two India-focused impact funds of $1bn each. GSG's leaders said social and environmental impact were becoming integral parts of decision-making – a shift that was now reflected in the portfolios of leading investors, the decisions of entrepreneurs and businesses, the choices of individual consumers, and the policies of government leaders. Tata Trusts are the major shareholder of Tata Sons, whose combined revenue is more than $100 billion. The philanthropic trusts support education, health, livelihood generation and art and culture. 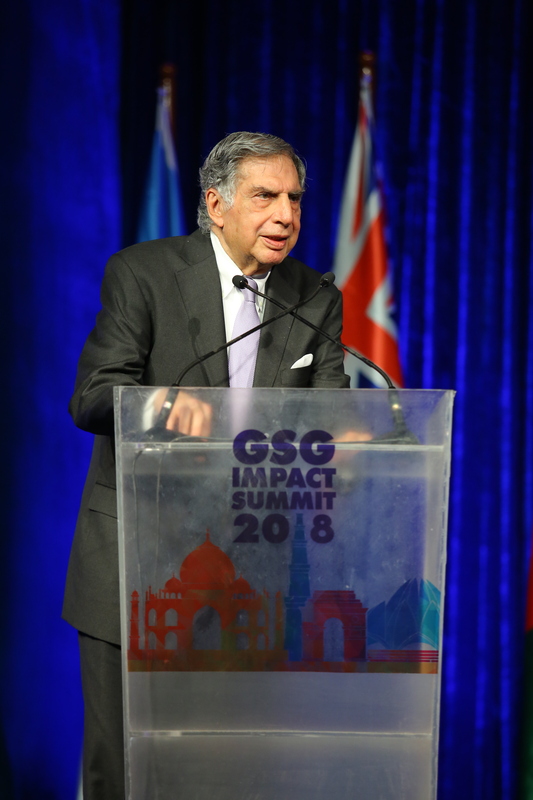 This was the first year that the Impact Summit was hosted in Asia, which the GSG said reflected “the growing power of India’s impact market”. Impact investing in India has grown to be a billion-dollar-a-year industry, with the potential to grow 20% to 25% a year. The sector is now focused on scaling new models of impact which will call for unlocking additional sources of capital. The Summit marked the launch of two wholesale funds to further the growth of impact capital in India: India Impact Fund of Funds (IIFF) and the India Education Outcomes Fund (IEOF). The IEOF is a first-of-its-kind, $1bn fund that will use finance at scale from development finance institutions (DFIs), foundations and other institutions to align with the government’s agenda of providing quality education with better learning outcomes. The IIFF will be a $1bn pool of equity and debt funds to finance ‘impact enterprises’ focused on social and environmental impact. The IIFF will align itself with India’s own social and environmental goals and the SDGs. “One of the biggest gaps in the impact investment ecosystem was that the bulk of the existing investment coming into India is all equity,” said Amit Bhatia, GSG’s CEO. By 2020, GSG aims to grow the global pool of investment capital from $150bn to $300bn and the number of people benefitting from this will grow from 500 million to 1 billion. • The GSG Honors were presented at the Impact Summit, in partnership with Pioneers Post. Meet the awardees here. Sir Ronald launches an "Impact Revolution"
"Nothing less than a revolution will enable us to achieve solutions at a scale that can improve billions of lives and our planet," says the "father of impact investing".